What was initially a call to investigate a possible burglary turned out to be a raccoon on the loose inside a Florida property management office. A concerned employee called 911 for help after arriving at about 8:30am on Wednesday at the All Florida Properties, Inc., office in Palm Bay. The worker found ceiling tiles collapsed in and papers riffled and strewn about. “It looked like someone was searching for a specific paper,” said Lt. Mike Bandish of the Palm Bay Police Department. 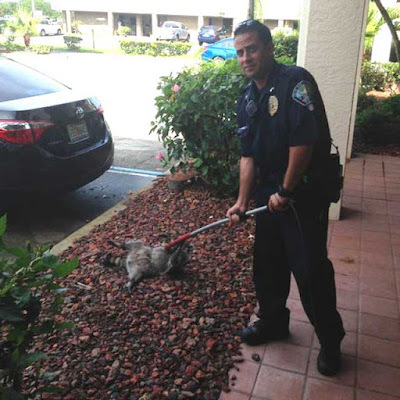 However, the burglar turned out to be a raccoon as Palm Bay police quickly responded to the scene. They immediately began going from room to room in a bid to find a possible reason for the office being in disarray. “They did a search and found the raccoon hiding behind a plant,” Bandish said. An officer captured the raccoon with a catch pole and then led him out of the office and into the wooded area behind the building.